Truly an ARCHITECTURAL GEM, this SPECTACULAR DUPLEX offers the rare opportunity to purchase a magnificent apartment in one of Park Avenue's most sought-after prewar CONDO buildings. Enter 11C/12C at 521 Park Avenue and experience the intimate elegance of this HIGH FLOOR CORNER Residence where traditional luxury meets European Sophistication. Perched above 60th Street and Park Avenue this SUN-FLOODED Duplex with 11FT CEILINGS and over-sized windows, features S/W/E/N EXPOSURES with open views on 60TH STREET, PARK AVENUE AND EAST SIDE SKYLINE. Beautifully renovated and impeccably designed with the most REFINED ARCHITECTURAL DETAILS s this unique home is the perfect place to entertain or just relax. It spans nine rooms elegantly divided between the two floors, each with its own private entrance. Upon entering the apartment on the 11th floor a gracious entry foyer with a charming powder room, showcases a sweeping grand staircase leading to the 12th floor private landing dedicated to comfort and privacy. 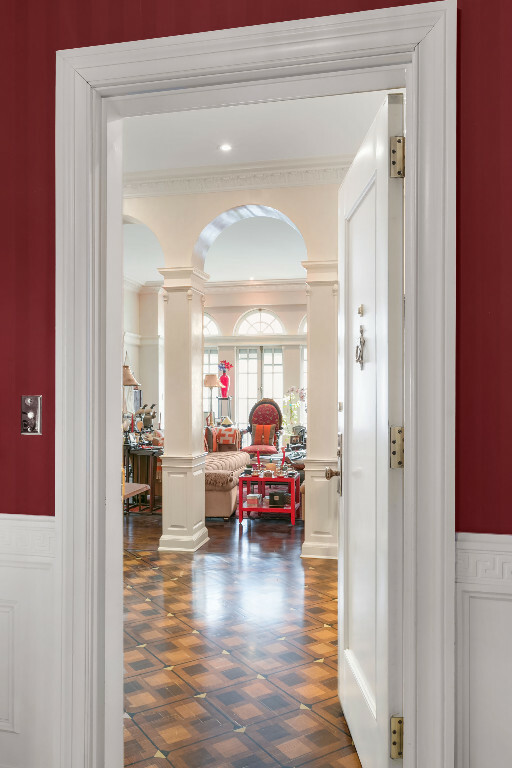 The entry gallery leads you through IMPRESSIVE ARCHES OPENINGS into spacious and light-filled south facing living room with french windows, a cast-iron Juliet balcony and an antique marble fireplace. Directly adjoined the corner broad library, with handsome custom cabinets/bookshelves and an antique fireplace, offers southern and Park Avenue views with a glimpse of Central Park The living room opens up to a well proportioned south facing ceremonious dining room, which leads to a large and airy corner windowed chef's eat-in kitchen with top of the line stainless still appliances and custom cabinetry. The adjacent windowed guest bedroom/maid quarter's room and private bathroom could be easily converted either to a den, private office or a laundry room. The Dining, Living and Library rooms can be closed up with elegant wooden pocket doors for privacy. The Upper floor welcomes three generous sun-filled south facing bedrooms with four en-suite marble bathrooms, two antiques fireplaces and a mechanical room. The private and spacious master bedroom with 11.25 ft ceilings and a beautiful marble fireplace, features two spa like en-suite windowed mosaic marble bathrooms with radiant heated floors, a Jacuzzi, a steam bath, a separate stall shower, two large walk in custom closets/dressing areas and additional storage areas. The lovely and well proportioned adjacent bedrooms have both an en-suite marble bathroom and a private closet. One of them is a corner overlooking Park Avenue. With custom designed details mosaic and wooden herring borne floors, chair/base and ceilings moldings, stucco wall finishes, antique fireplaces e.g as well as central air and sound system with in-ceiling speakers, radiant heated bathrooms, e.g this apartment is a mix of tradition and convenience. Designed by William Boring, 521 Park Avenue is a classic prewar white glove doorman building in a premier Upper East Side location. Completed in 1911 and converted to a condominium in 1987, this stately and intimate 12 story and 27 residence building sits in one of the most prestigious addresses near Central Park, the finest dining and shopping of Madison and Fifth Avenue, close to Midtown and at the heart of convenient subway and bus transportation to anywhere in the city. The condominium amenities include a 24 hr doorman, elevator, gym and is pet friendly.